After my trip to Turkey in September, I never actually stopped painting miniatures or making terrain or playing games, but those parts of my gaming life have occupied a smaller portion of my time than otherwise. For one thing, I'm now up to TWO rpg nights a week, one of which I'm running; for another, I got into Android: Netrunner, a fantastic card game that I have been really enjoying. Those games, plus the doldrums I have been stuck in for the last while building some more boring hedgerows, have made it hard for me to get enthusiastic enough about miniatures gaming to keep up my phlog. Recent developments, though, have sucked me back into miniatures land once again. ...it quickly became clear that it was going to be a huge undertaking, and I wasn't going to have enough time. So I decided to go back to my Force On Force WW2 project from this summer and resurrect it for the convention. 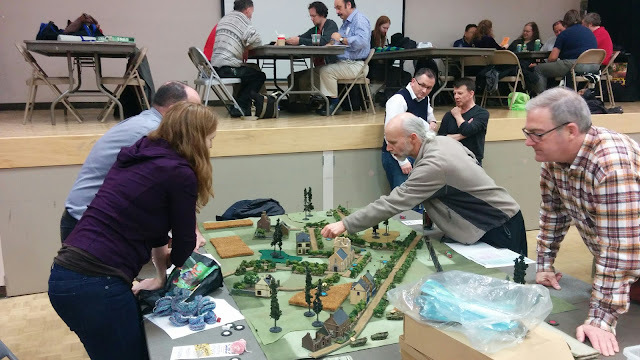 I prepared a new historical scenario and ran it as a drop-in game at the monthly Trumpeter meeting on Friday. 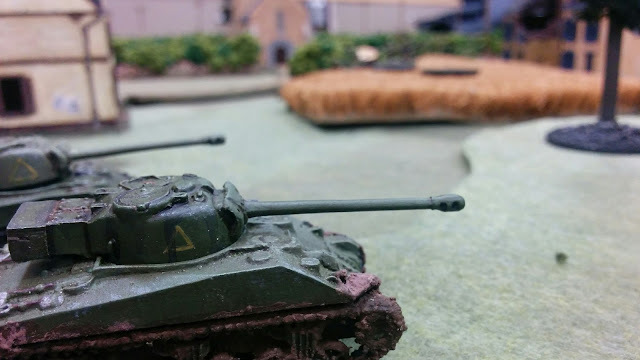 My other scenario has Canadians attacking a village held by Germans, so I wanted to find a situation where I had Germans counterattacking against Canadians. German doctrine in WW2 was to always counterattack, so finding a story wasn't hard. 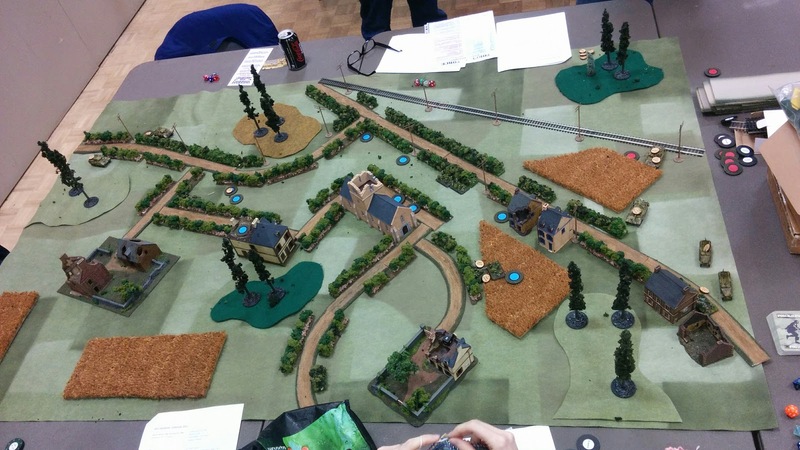 The scenario I created takes place during Operation Windsor, when the Brits and Canadians finally began to break out of their beachhead at the beginning of July and push on Caen. Several regiments of the Canadian 3rd Infantry Division were able to take Carpiquet, a small village and airfield on the outskirts of Caen, and then had to withstand punishing counterattacks from the 1st SS Panzer Division. At one point, C company of the North Shore New Brunswick Regt. 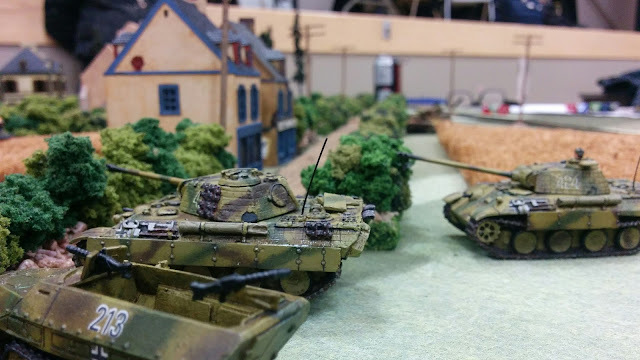 was down to around 40 men and had to hold the line against SS Panther tanks until some M10 Achilles arrived and drove the tanks off. Here is the new scenario, though it's the work-in-progress version; I need to add a map and make some changes (discussed below) before I consider it finished. I thought the game went fine. I was using the rules for fog of war (phlog post link above) that I created in the summer, and I think the blinds movement works well. The cons are that it has the effect of slowing the game somewhat, and the table doesn't look quite as cool with a bunch of poker chips moving around instead of painted miniatures. The positives are big, though: neither side knows what the other is doing, especially during deployment, and it makes feints / distractions / bluffs possible that couldn't be done without hidden units. Also, I didn't let the different sides look at each others' force rosters, so neither really knew what they would be facing. It made for a fun dynamic. The rest of the rules worked fine in the WW2 theater, though I forgot my rulebook at home (herp derp) so I had to muddle through some parts I couldn't remember precisely. The scenario needs a bit of tweaking. First, when I play this at the convention, I will hand each player a group of units, and those units will be that player's responsibility for the game. As it was, I had two people on the German side and three on the Canadian side, and there was a lot of analysis paralysis as every decision on both sides had to be sent to committee before it could be acted upon. This would also help allay the "quarterbacking" problem that's common to all multiplayer games, where one player ends up taking over and runs the whole thing. 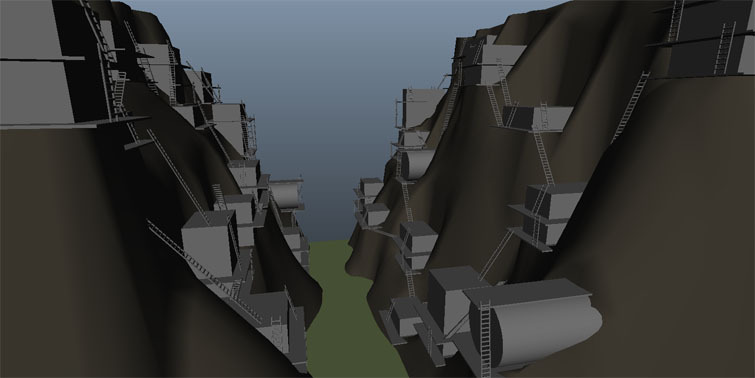 Second, I will change the mission objectives for the Canadian side - they are very difficult as they stand now. Instead of giving points for "No X crosses front line" I will give points for "No surviving X on Allied side of front line at game end". I thought the balance of forces was good. I tried to make the scenario as historical as I could, with the resources at my disposal, and it made for a very close game. At the end of the test game, the VPs were perfectly tied, so nobody ran away with an easy win. In fact, the result was very close to the historical outcome, so I would consider that a success. Special thanks to David, Grace, Alex, Gord, and Will for helping me test out the scenario! Those game pictures look nice! Are you still going to do that Pulp Alley game one day... because the mock-up looks intriguing! I definitely still plan to build that post-apocalypse board - there was just too short a time frame between when I got the idea and when I would need it for the convention. Maybe next year!